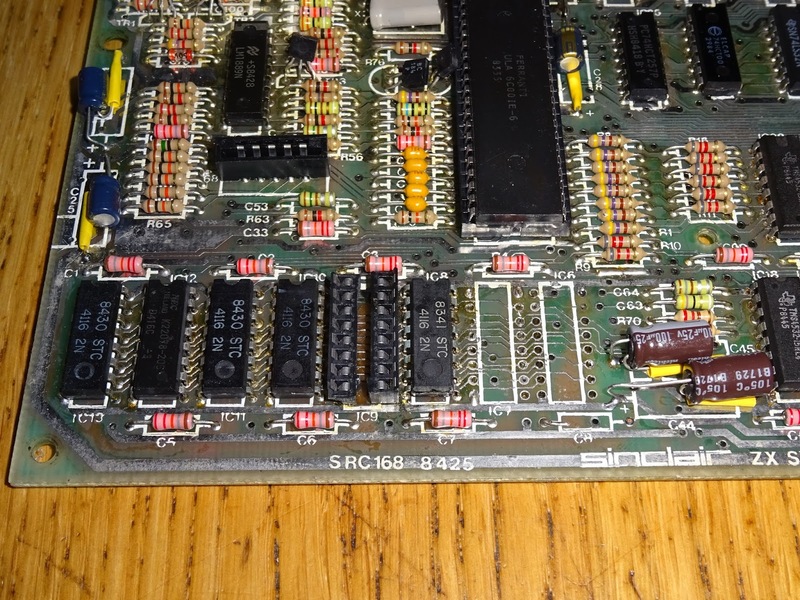 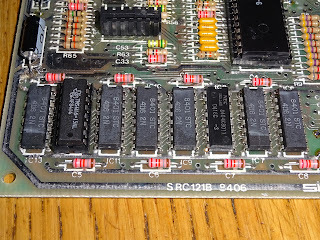 A slightly belated follow up to my previous Oric 1 Repair post, which covered replacing some faulty parts and fixing the reset circuitry. 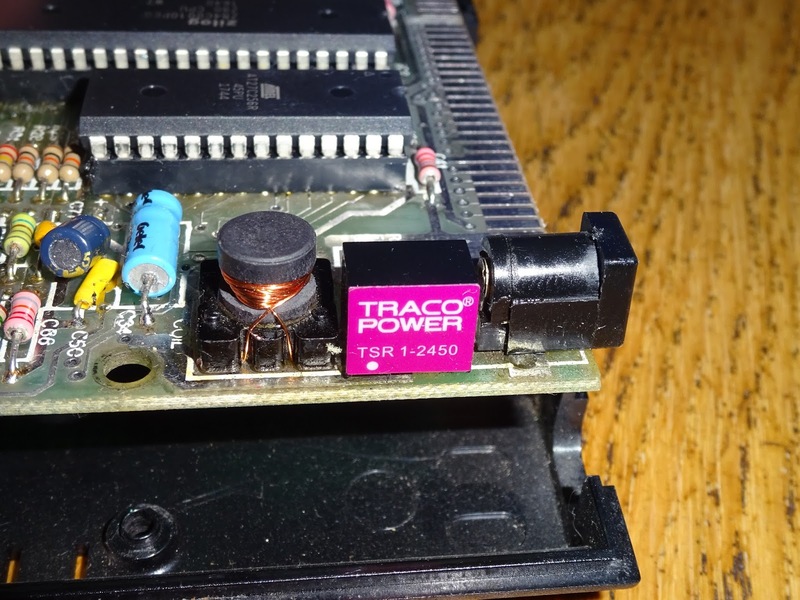 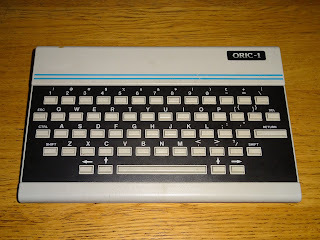 That Oric-1 had arrived with the power supply regulator bypassed, so the input was 5V DC only. 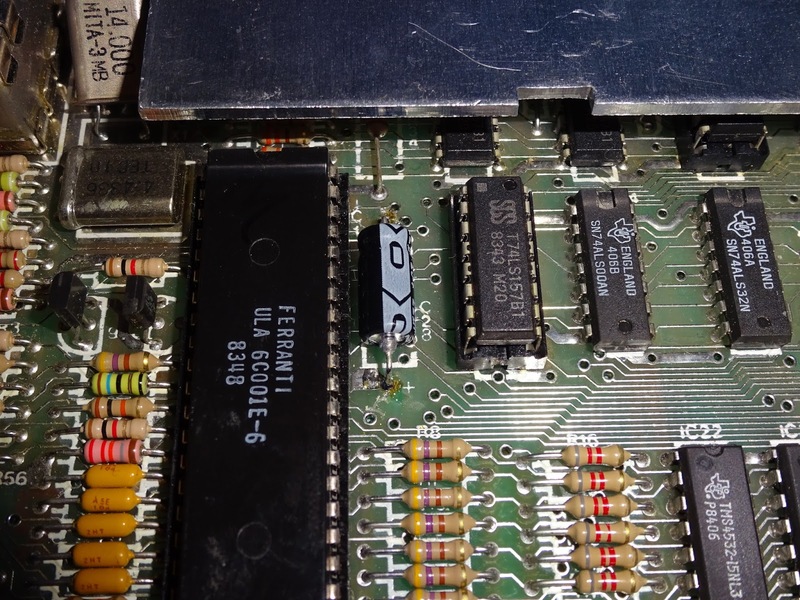 The arrangement on the Oric is unusual, in that to take 9V DC down to 5V DC it uses a 7905 regulator, rather than the usual 7805. 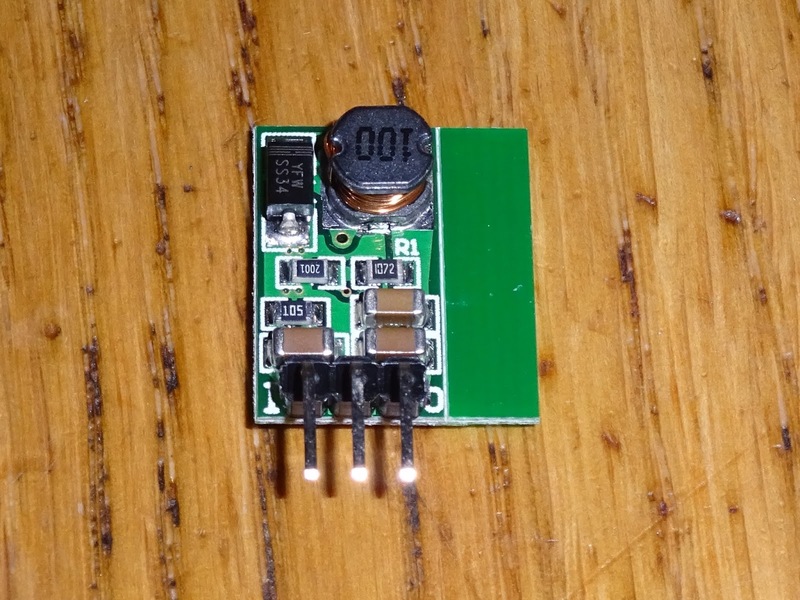 The 7905 is a negative regulator, so is inserted in the 0V line. Other than maybe an economic reason, there doesn't seem to be a good technical reason for this. 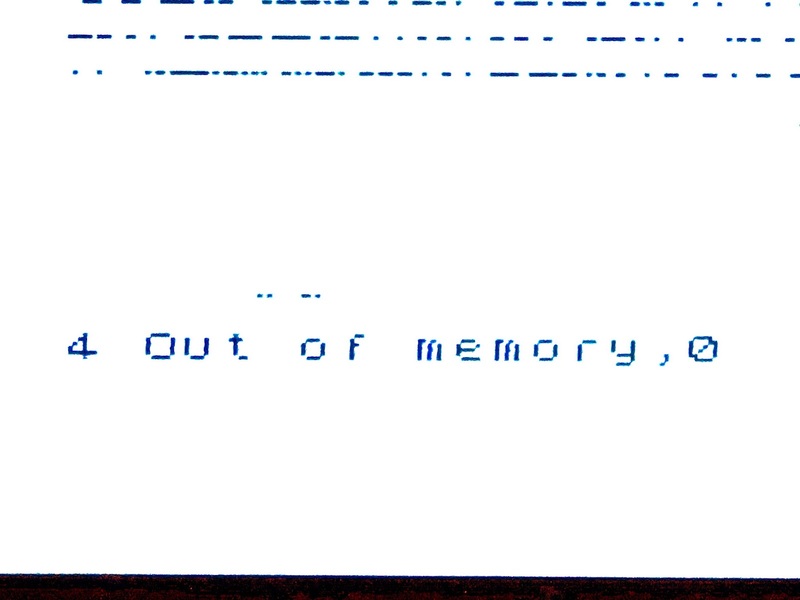 Indeed, there are several against it. 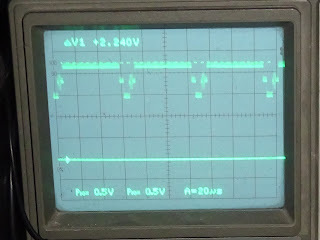 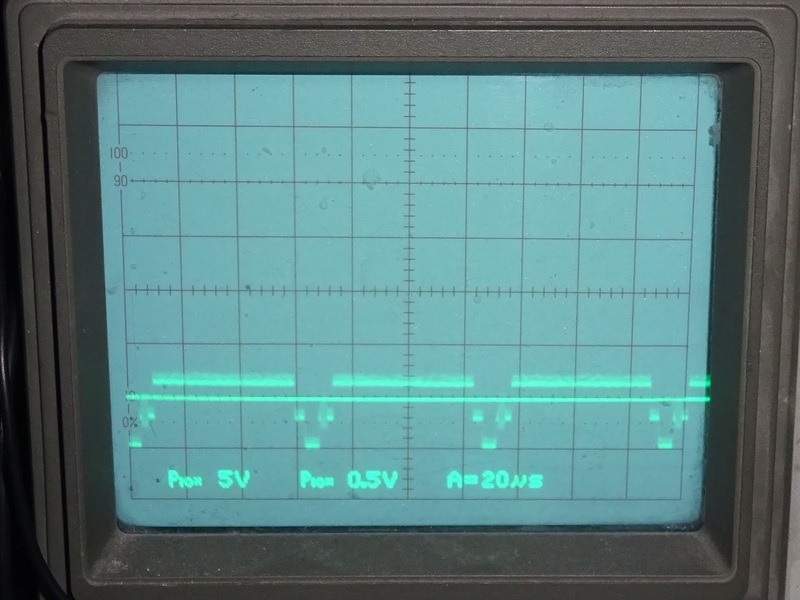 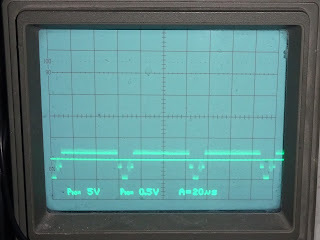 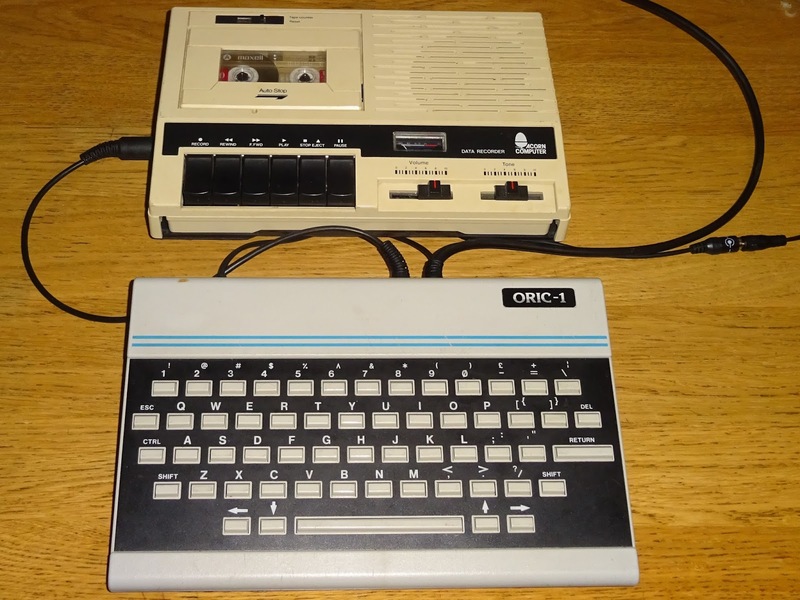 This arrangement means that with 9V DC input, the ground rail of the Oric is around 4V DC relative to the input, and if the power supply used happened to be grounded to mains earth, and you plugged it into a TV or cassette recorder which was also grounded, you would be shorting out the regulator and feeding the logic with 9V. 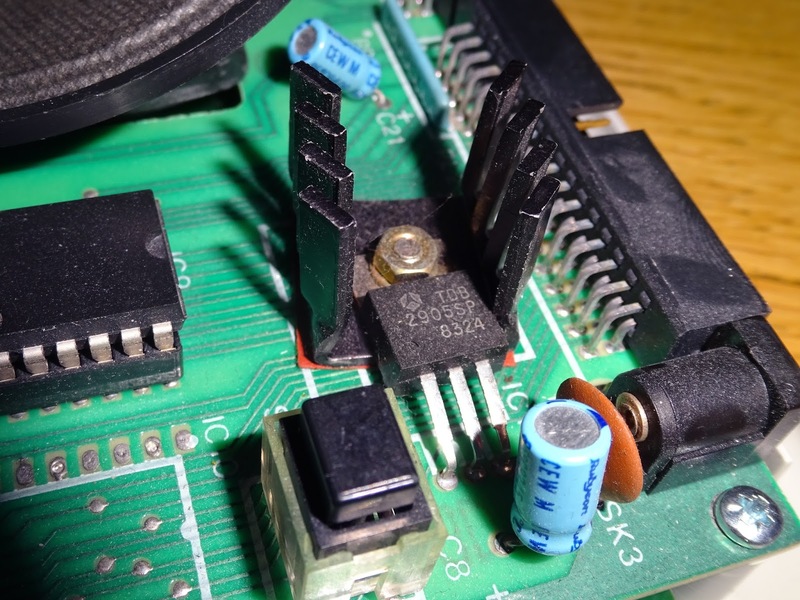 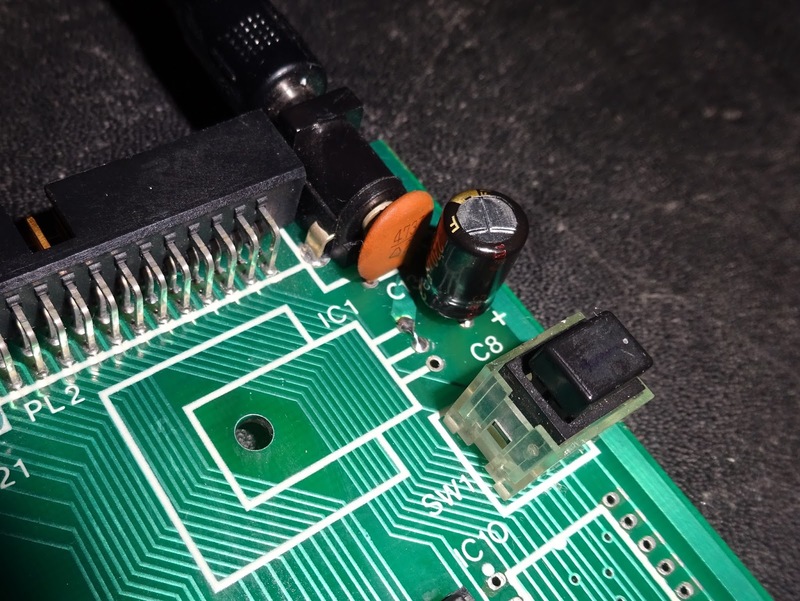 The same could happen if you used a power supply splitter to split your 9V supply to drive a cassette recorder or small TV as well as the Oric. 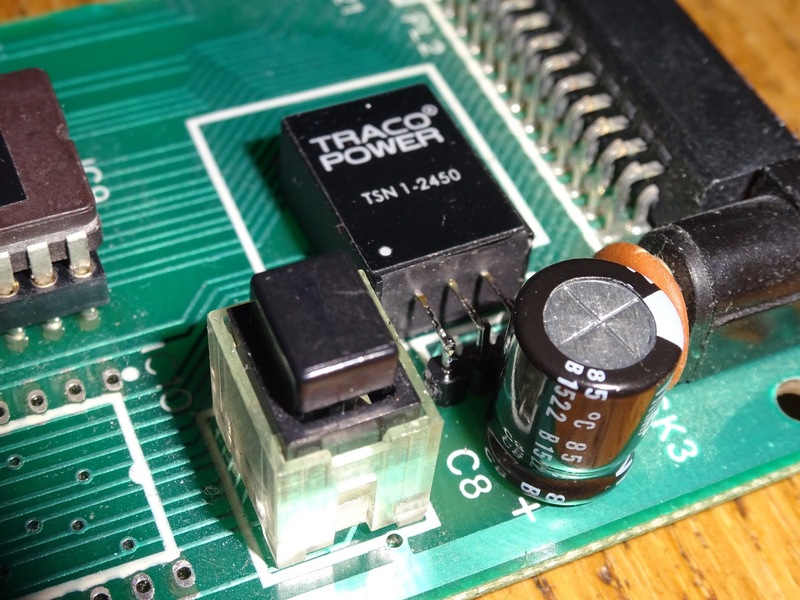 Not an unreasonable thing to do, but again it would be shorting out the ground rail. 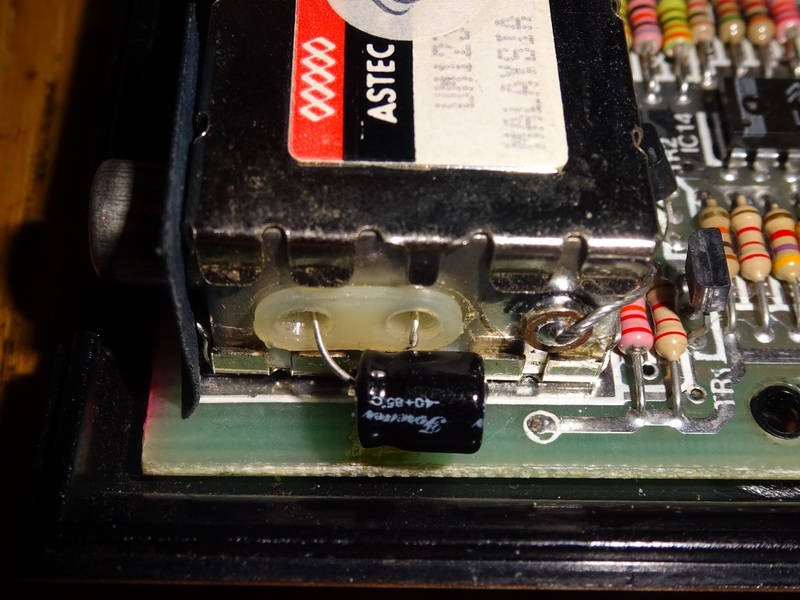 Normally, the 7905 (or a 2905 which is the same thing) is mounted with a small heatsink. This runs very warm, so it is a good idea to add more metalwork to help dissipate the heat, or replace it with a DC-DC converter. 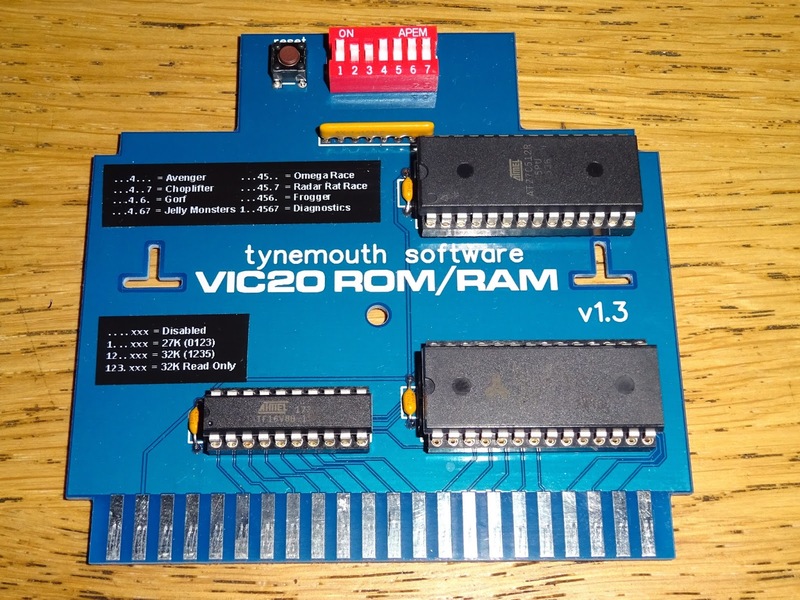 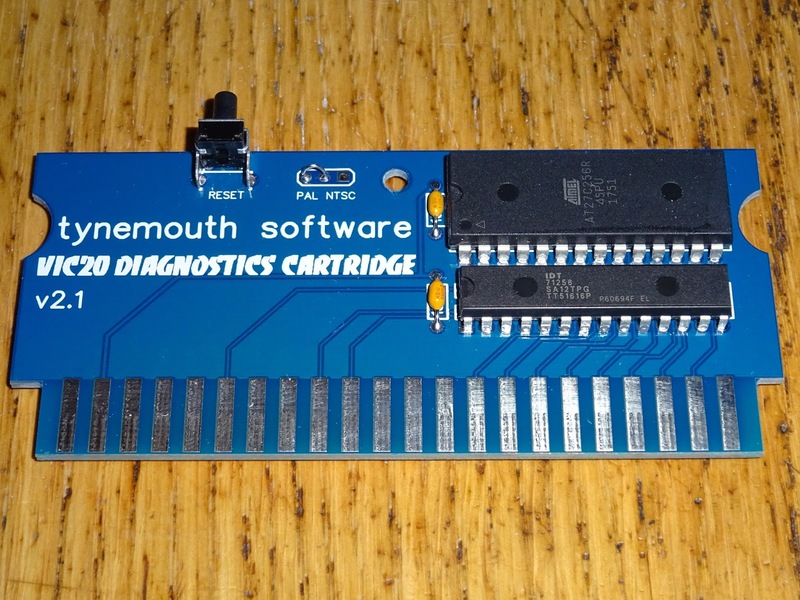 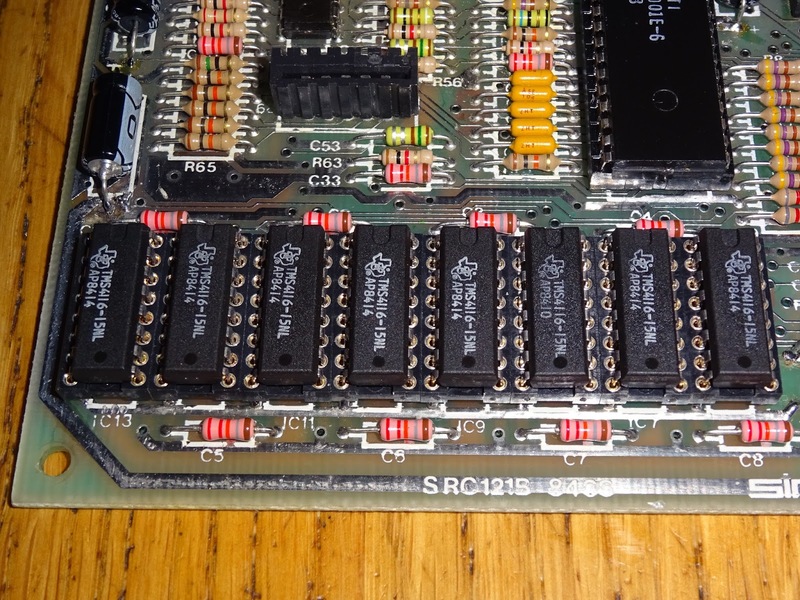 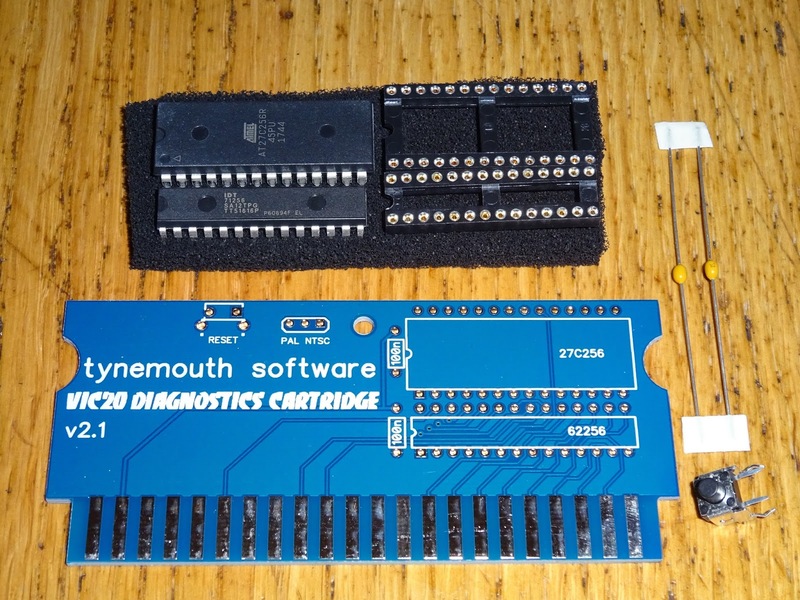 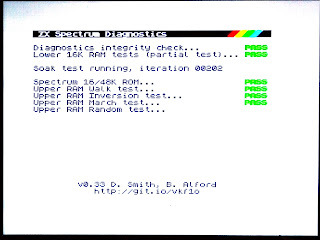 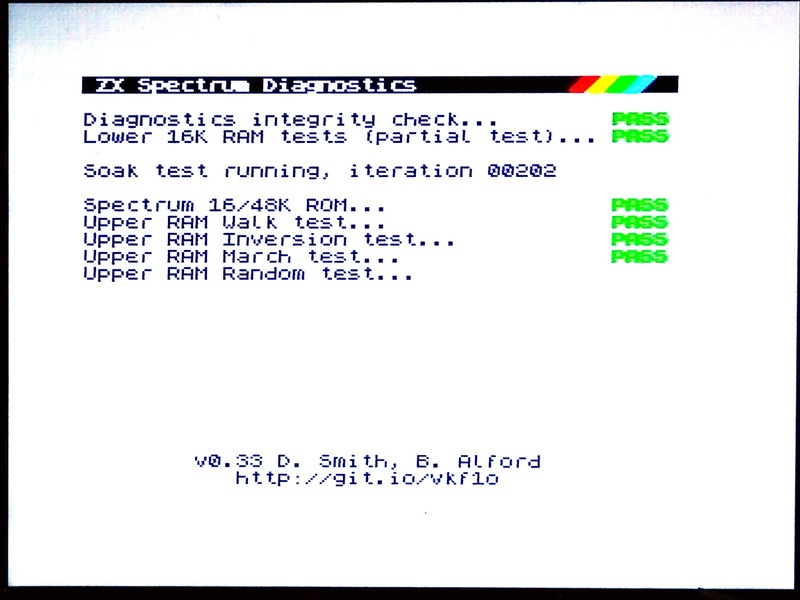 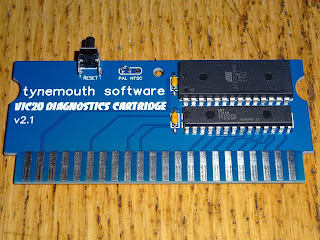 There are many 7805 replacements to choose from, and on things like the ZX Spectrum, these are a worth while upgrade. 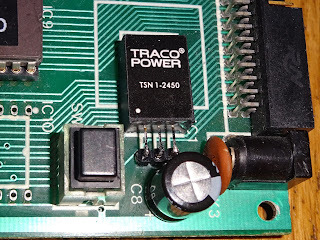 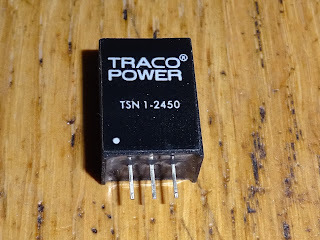 Here using the Traco Power TSR-1-2450. 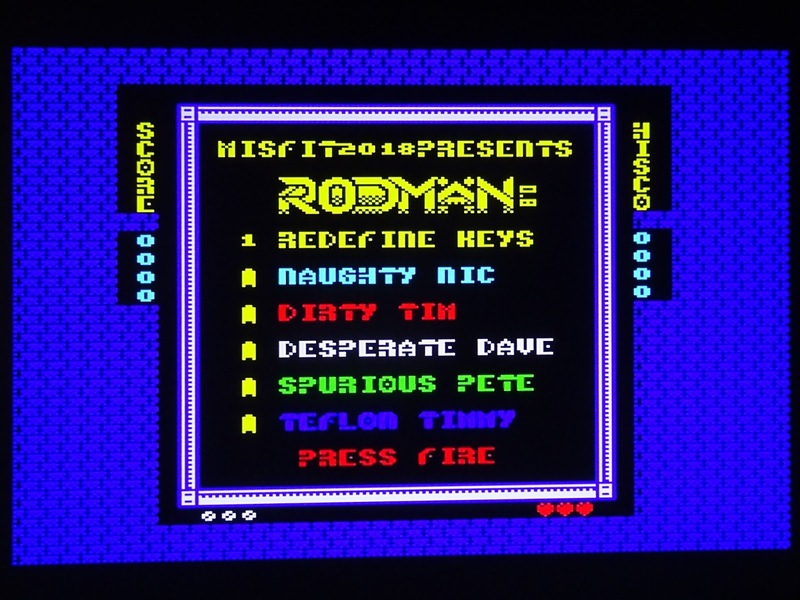 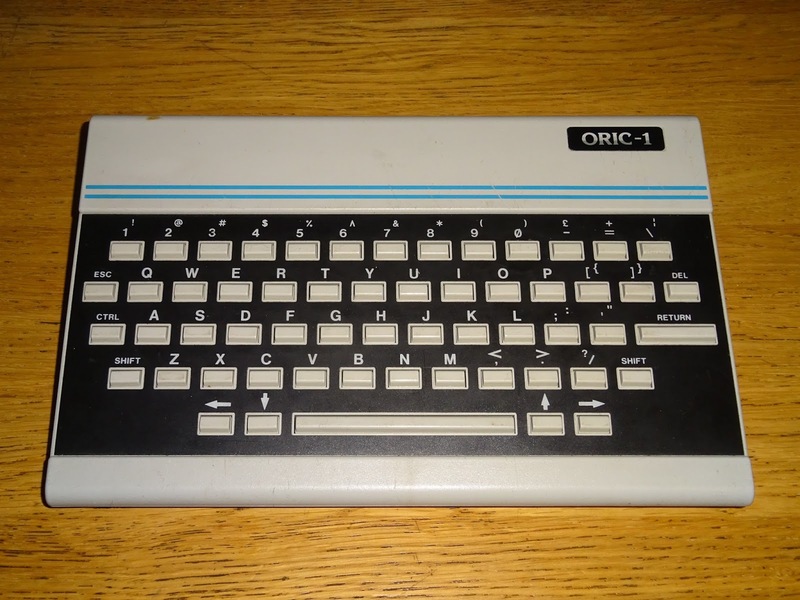 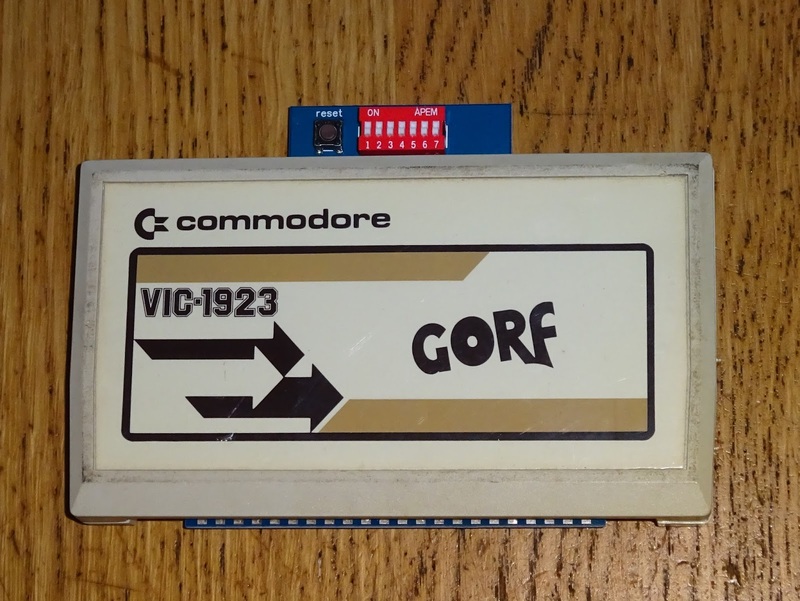 The Oric is a little more complicated, as it needs the 7905 version. 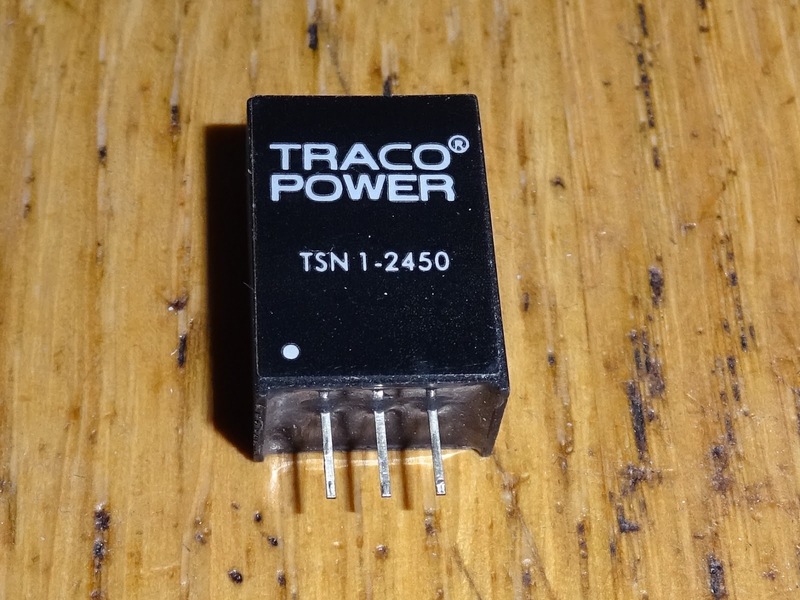 There aren't as many to choose from, so I got a TSN 1-2450, the N being the import part of the name, meaning negative. When I ordered those (which was a year or two ago), I couldn't get one with right angled legs, but I think they are available now. 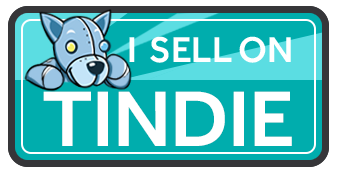 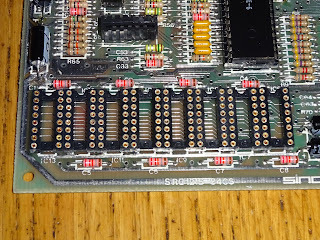 Being less common, these were about three times the price of the positive version, but I wanted to avoid cutting tracks and messing up the board to try to fit a positive version. 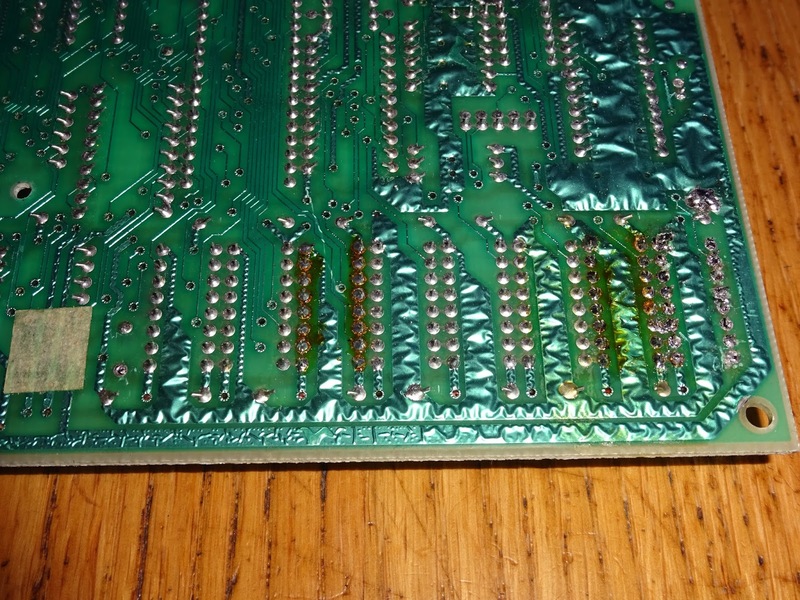 To fit that, I soldered it to some 0.1" header and laid it flat on the board. 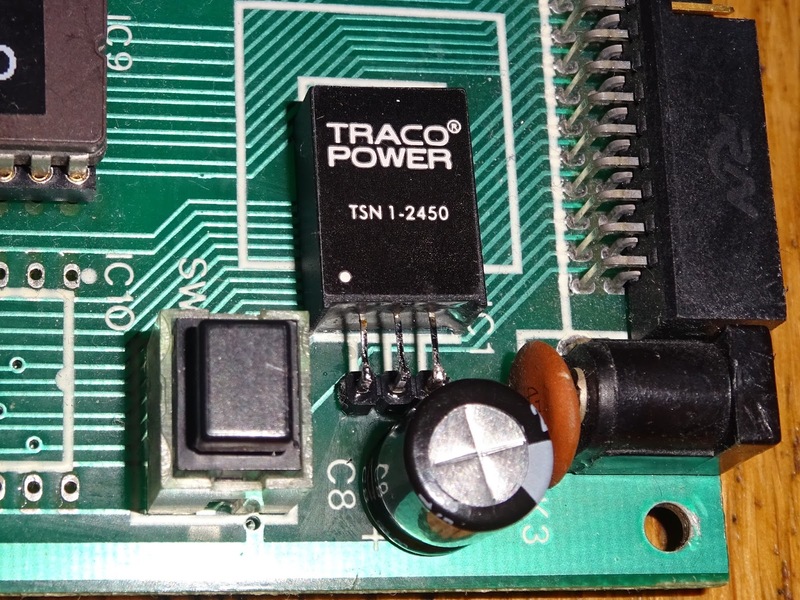 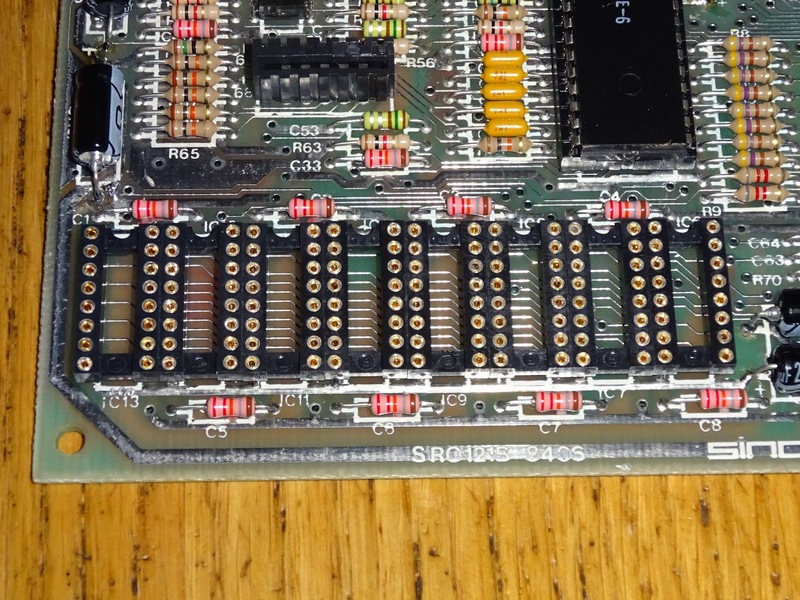 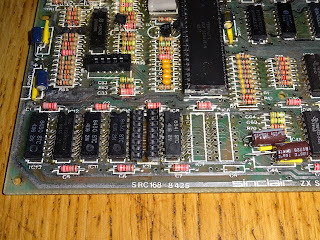 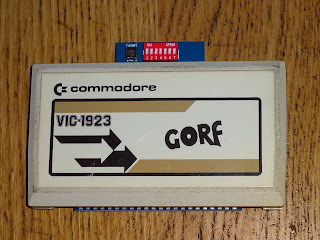 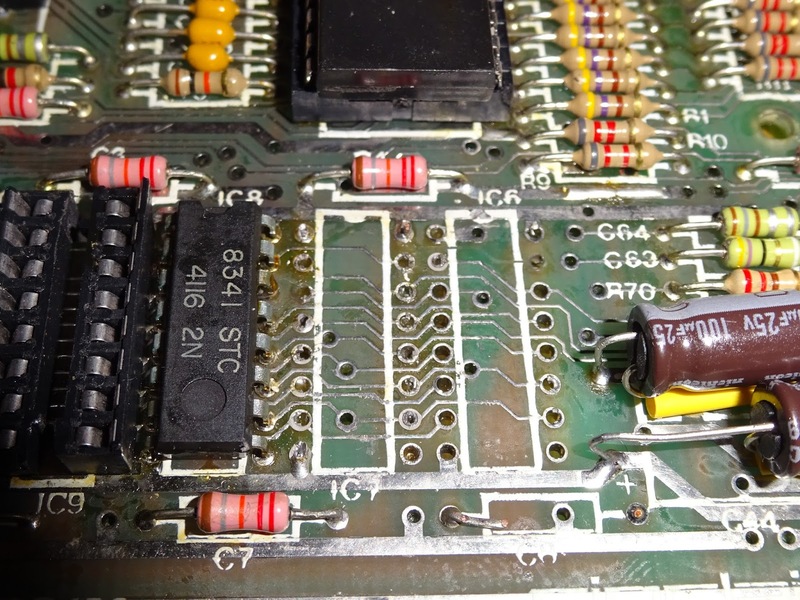 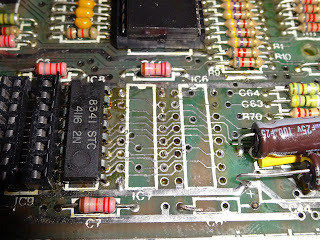 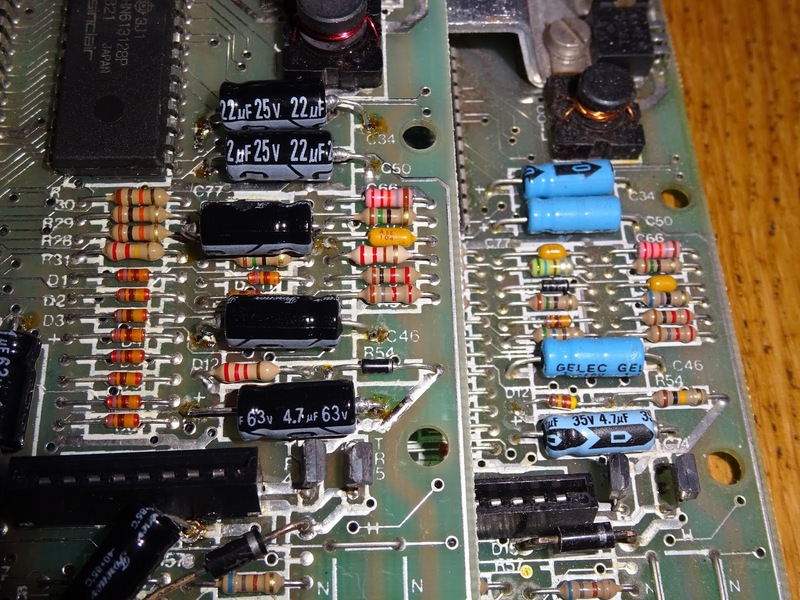 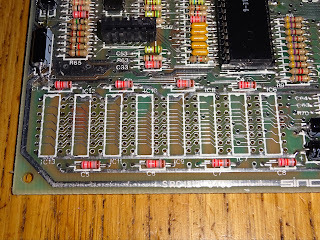 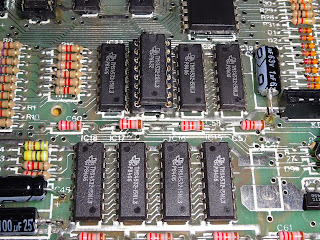 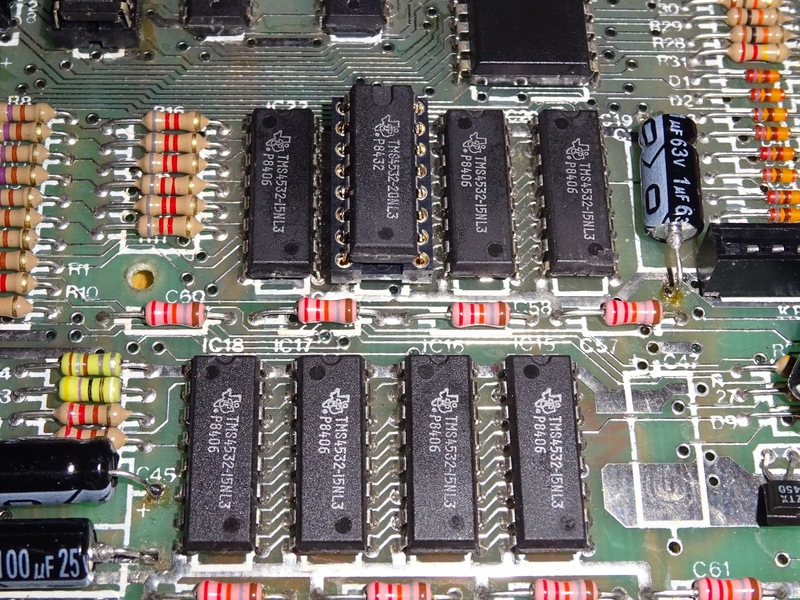 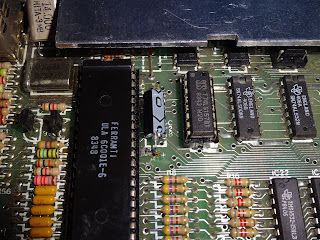 With that fitted, I could remove the '5V DC' warning stickers I had placed on the Oric and connect a 9V DC centre positive supply to it. 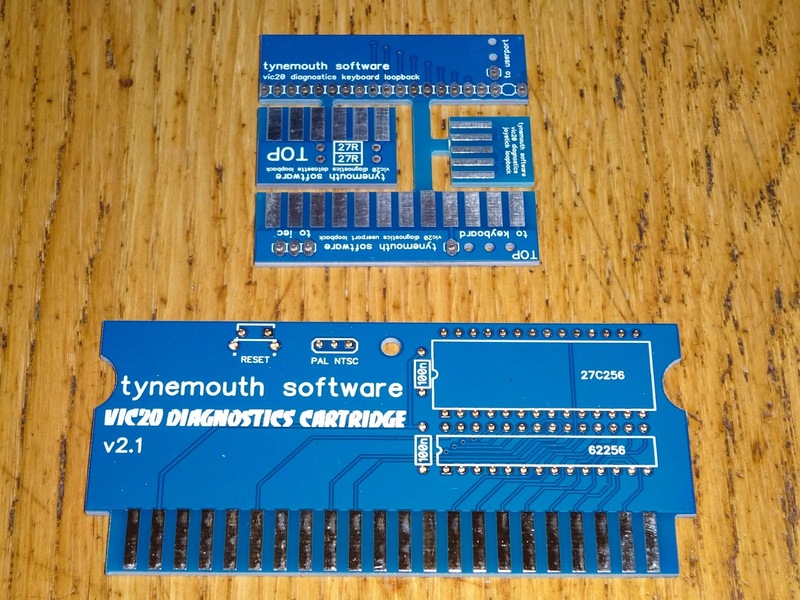 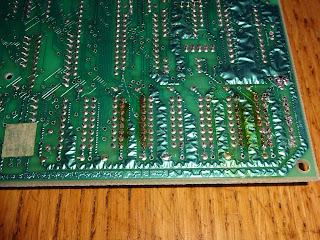 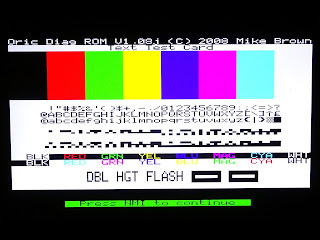 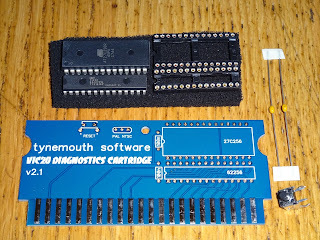 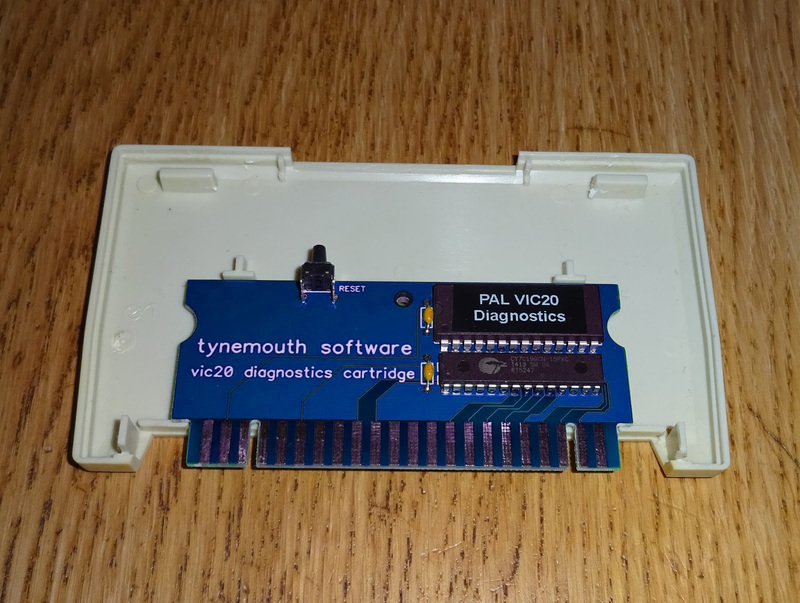 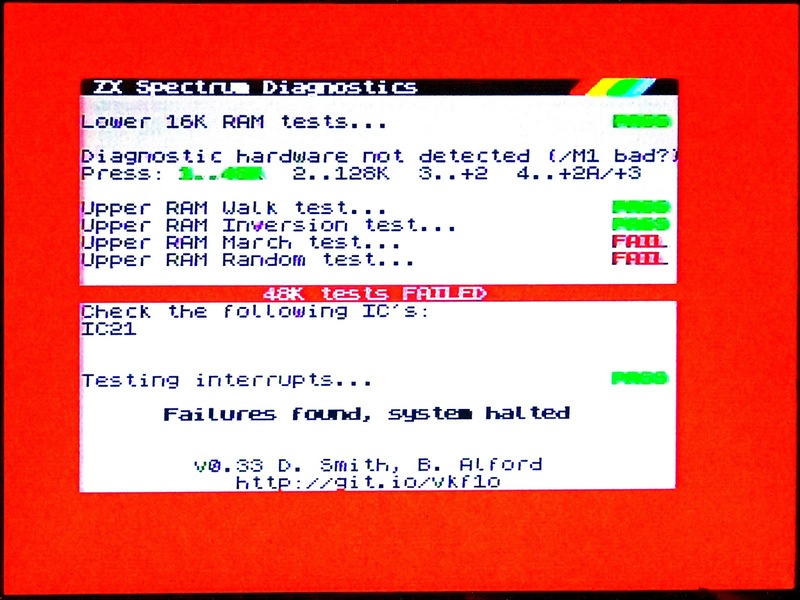 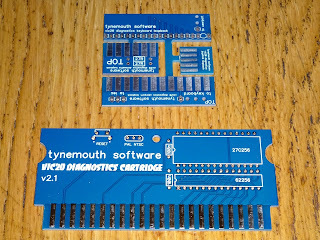 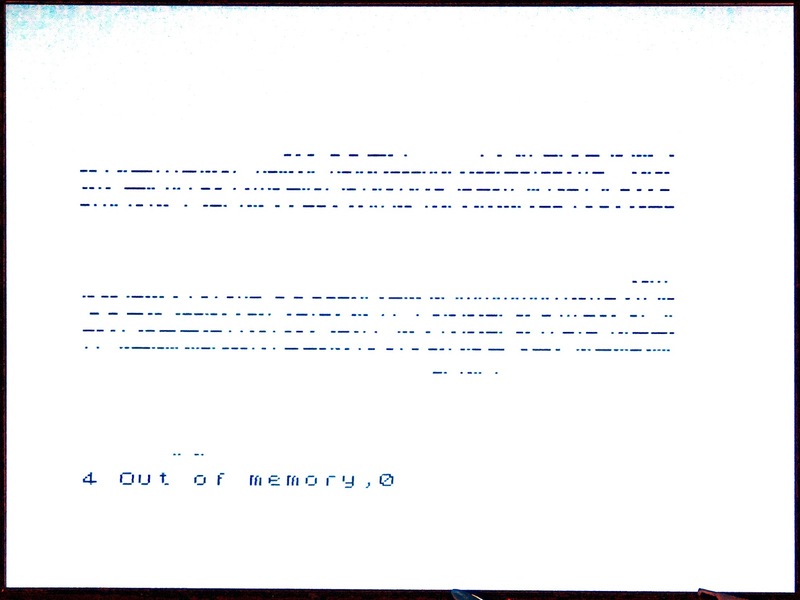 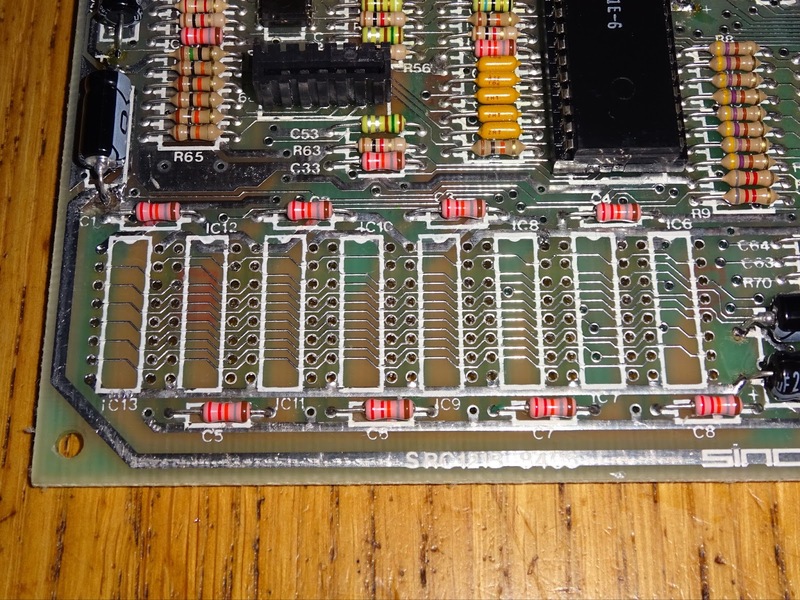 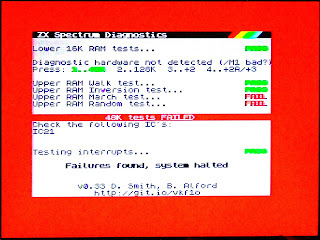 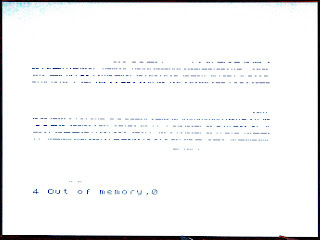 That's not ideal, as I use a lot of centre negative supplies, for the ZX Spectrum, Commodore 16, Minstrel ZX80 clone etc. 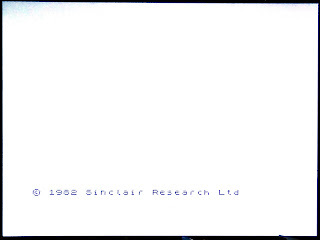 Next to be addressed was the video output. 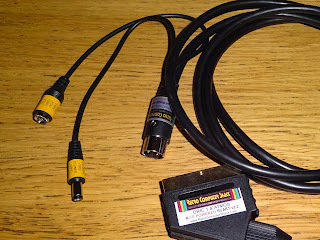 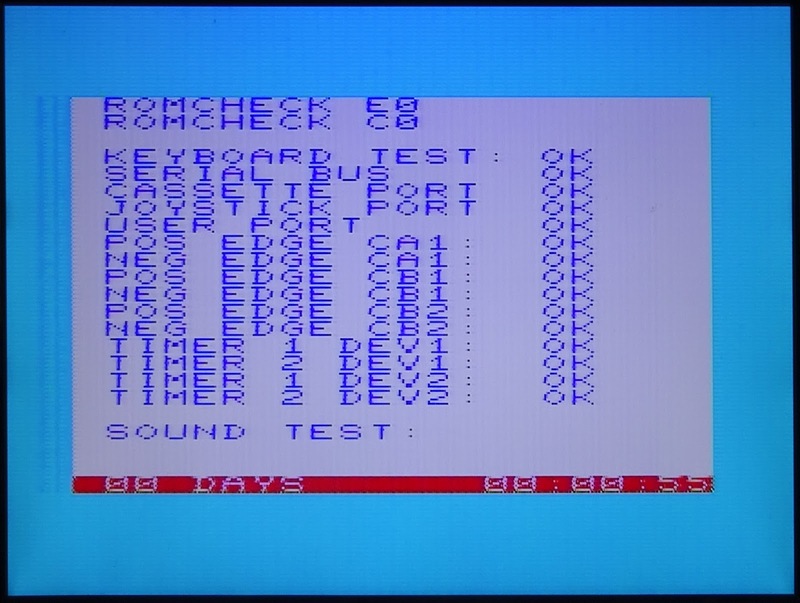 I had been using a temporary composite video modification, but I wanted to use the RGB output. 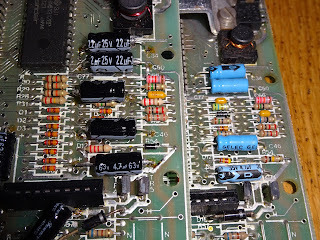 As usual in these cases, rather than mess around trying to work out pinouts and if resistors are required etc. 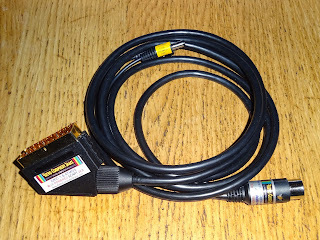 I ordered a lead from Retro Computer Shack. 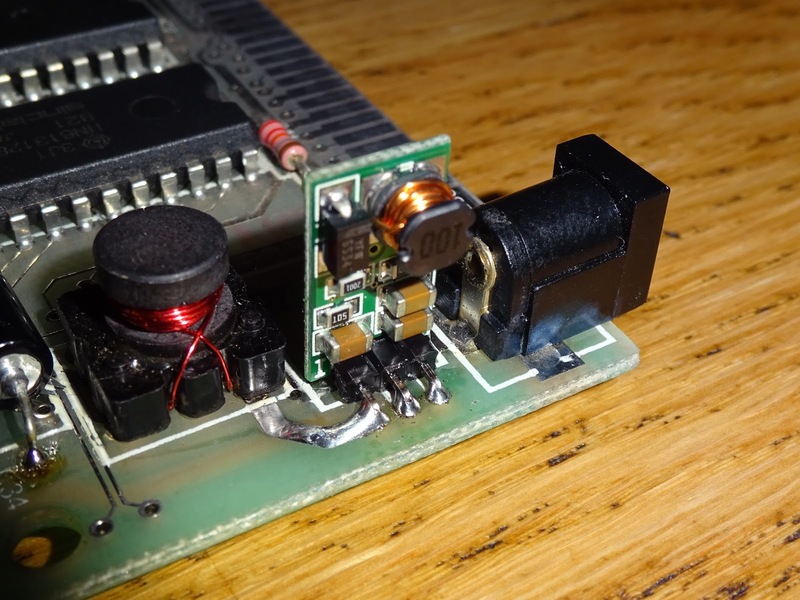 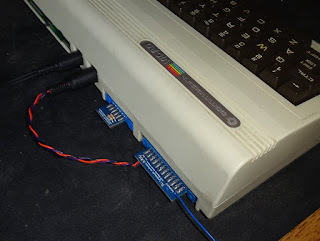 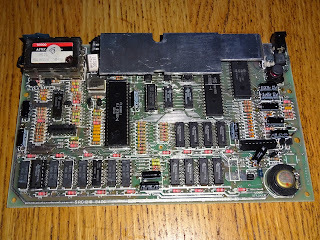 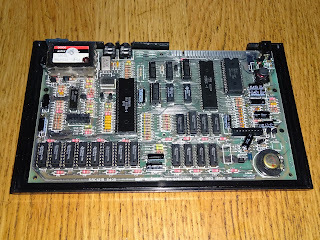 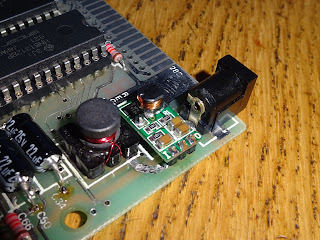 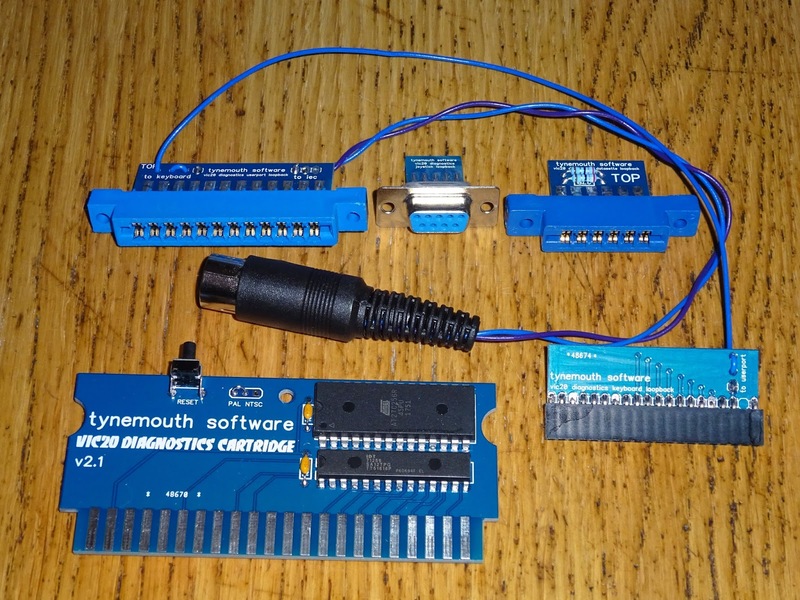 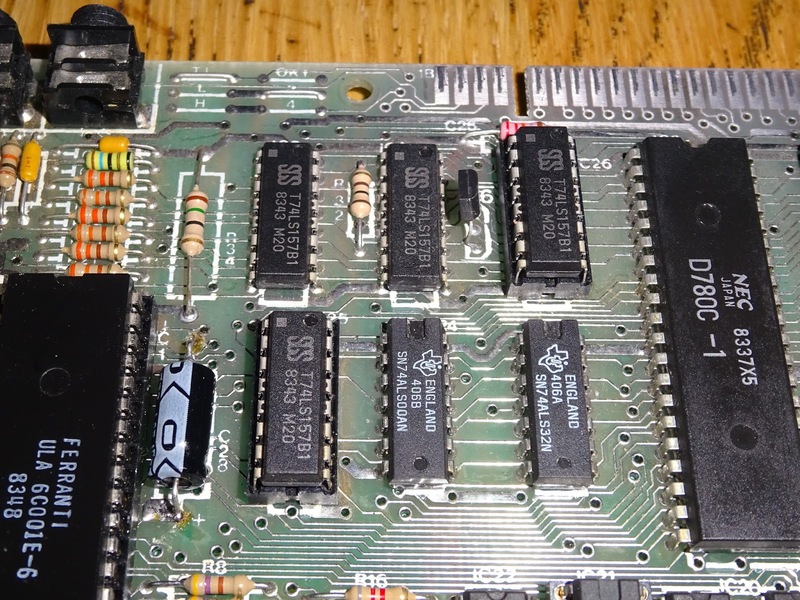 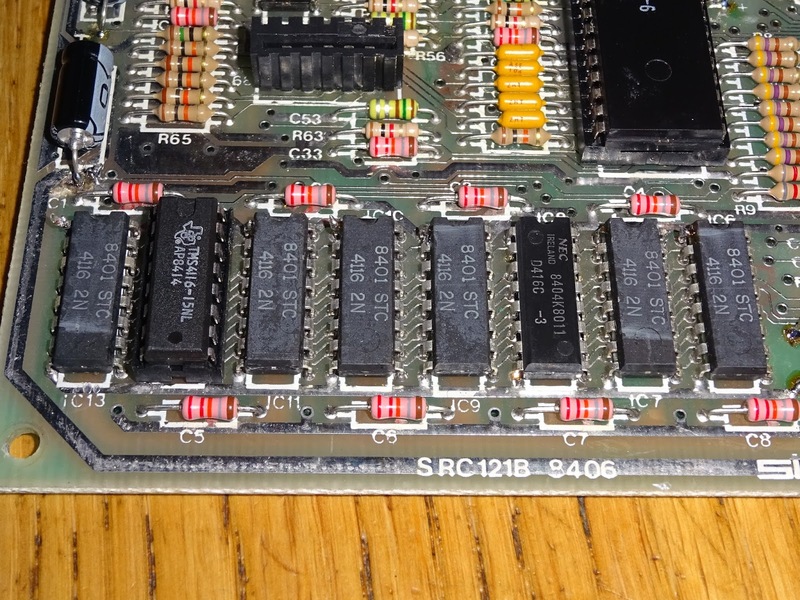 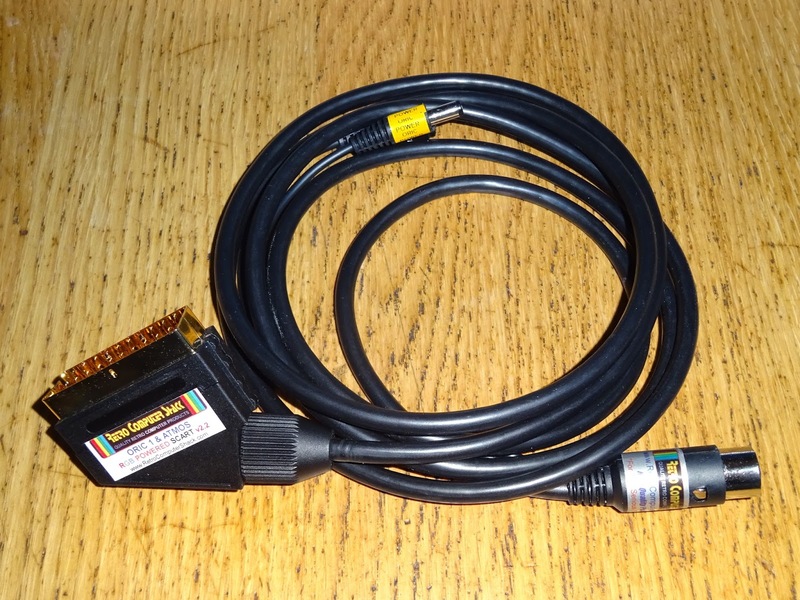 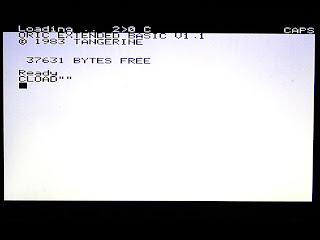 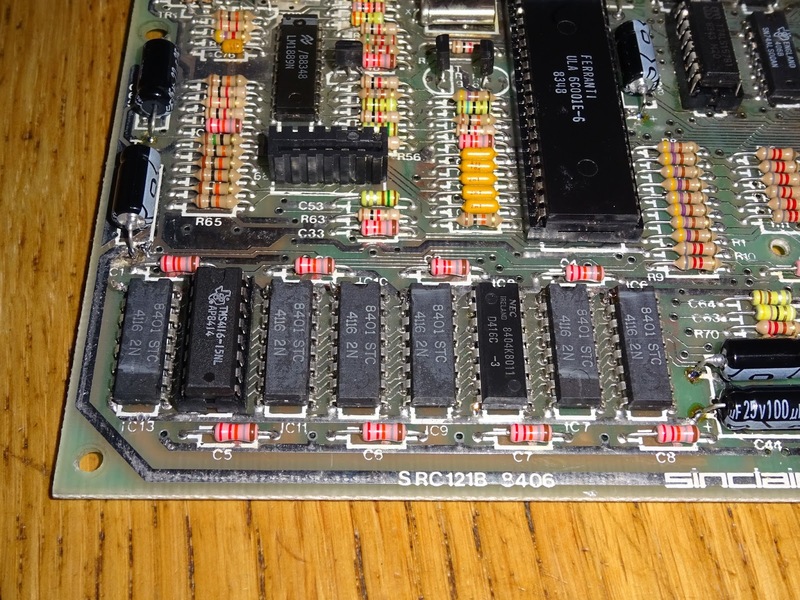 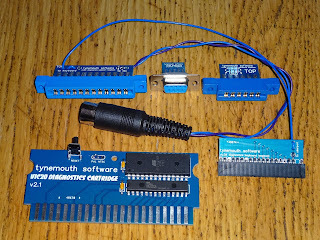 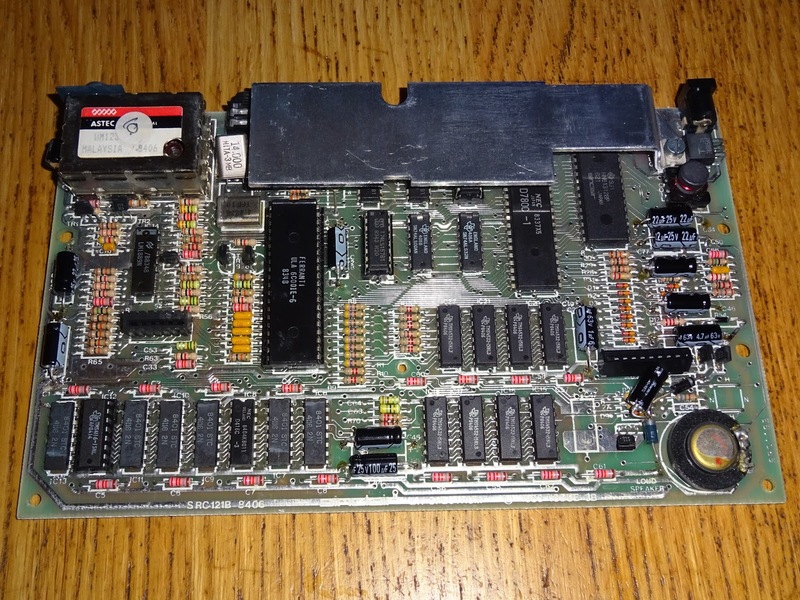 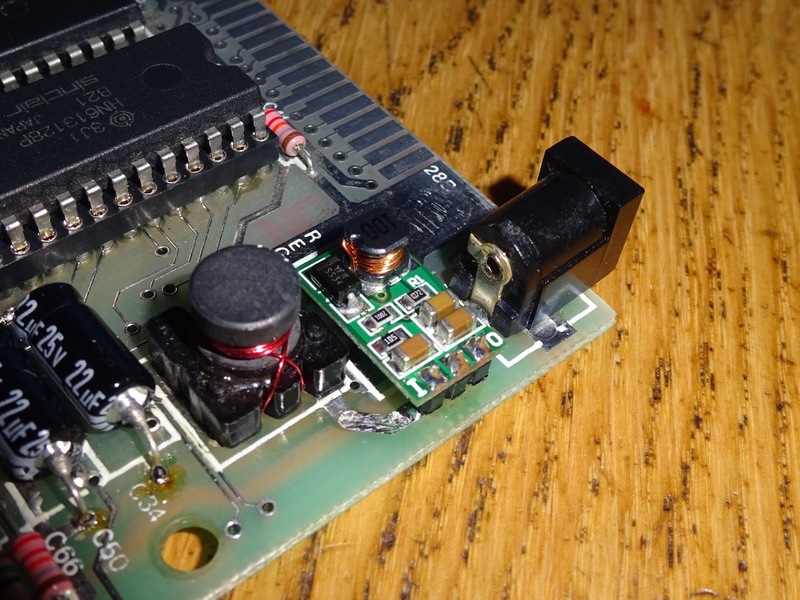 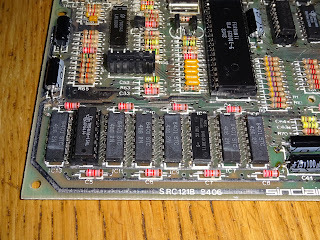 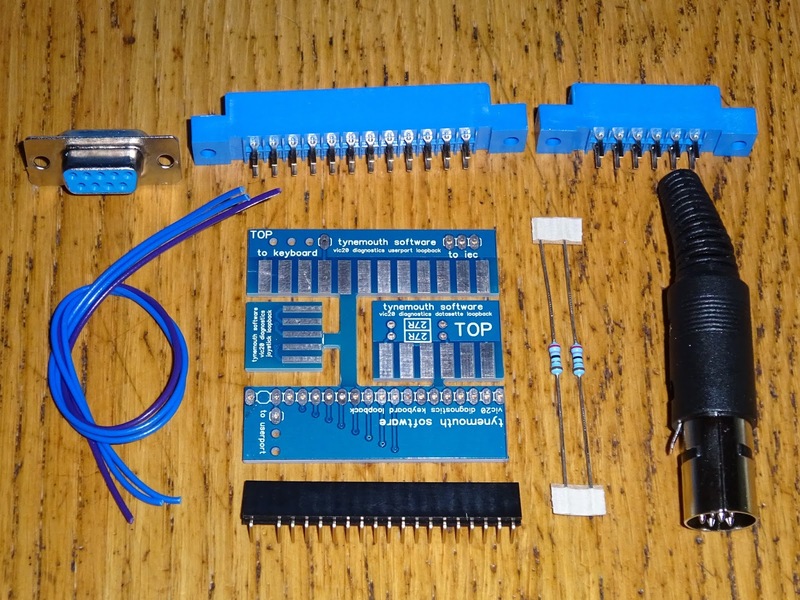 This one handled the SCART RGB switching voltage required by tapping into the Oric power, the power supply plugging into a short cable connected to the DIN plug, and another short cable going off to power the Oric. I took the opportunity to make a small change to the lead. 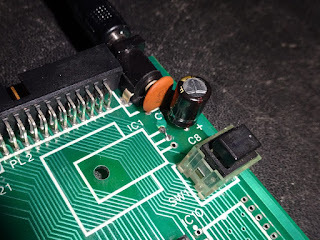 Since the power supply was connected to this lead, I swapped the wires around on the DIN plug, and made the input jack 9V DC centre negative. 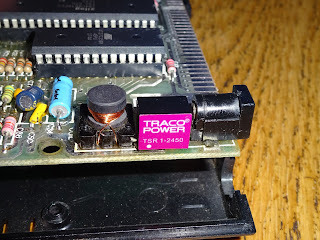 I updated the label on the DC input jack to make it clear. 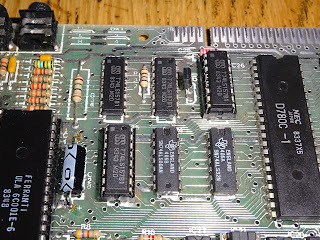 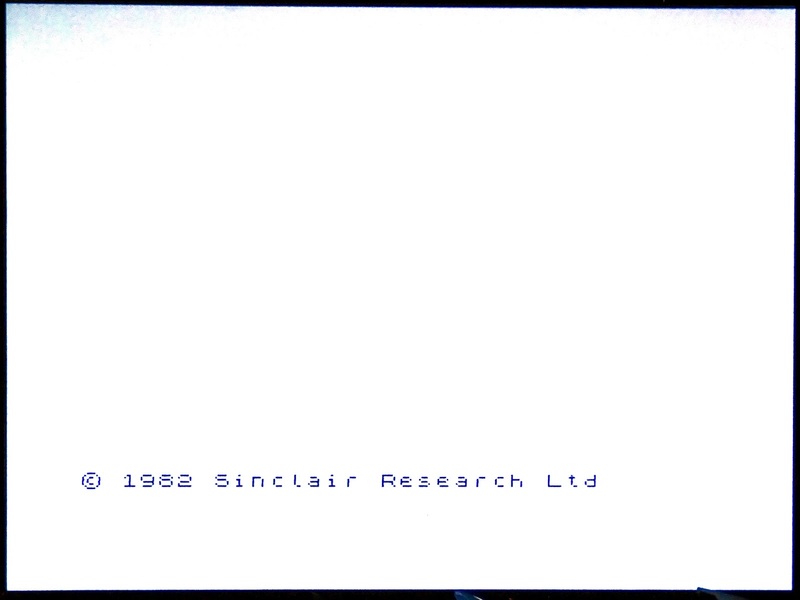 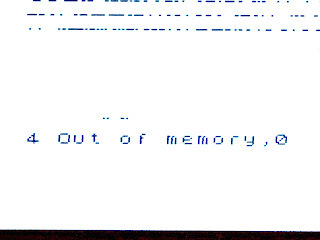 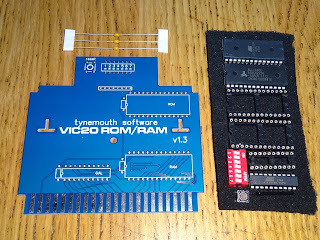 This meant that without having to modify the Oric, I could use my normal 9V DC centre negative supplies, such as the ones I get from The Future Was 8 Bit. 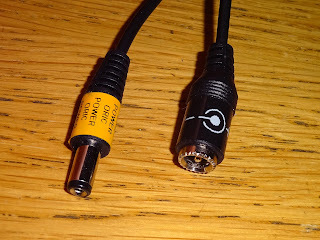 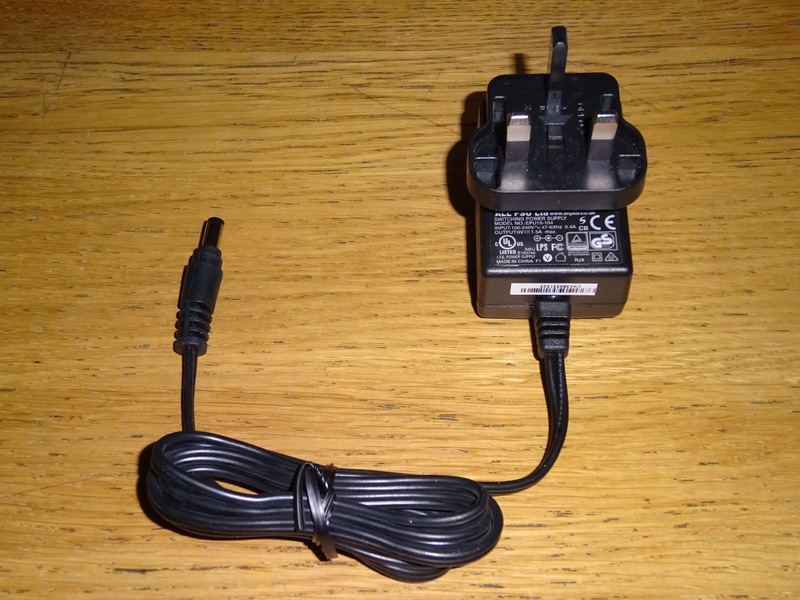 I did a similar thing to use these power supplies with ZX81s and Atari 2600s, I made a short 3.5mm jack to 2.1mm DC jack socket lead, wired centre negative. OK, that the power and video side sorted. 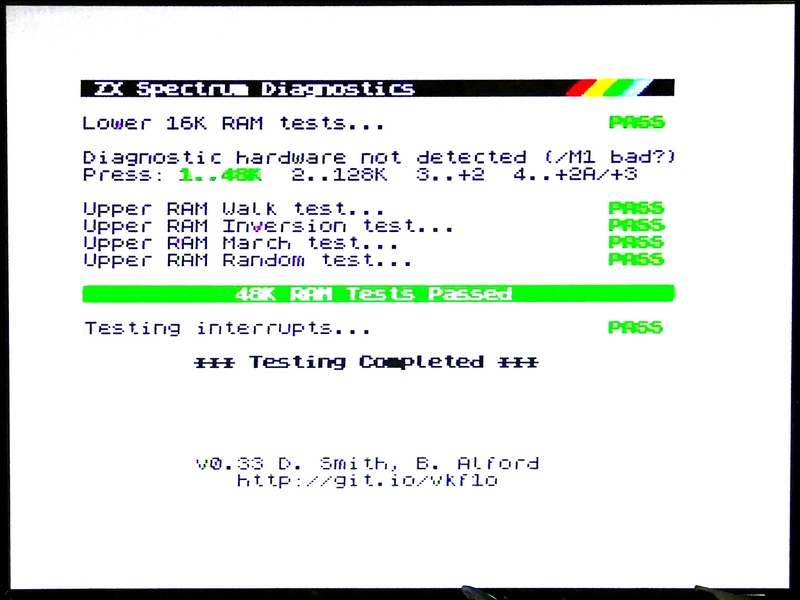 Time for some testing. 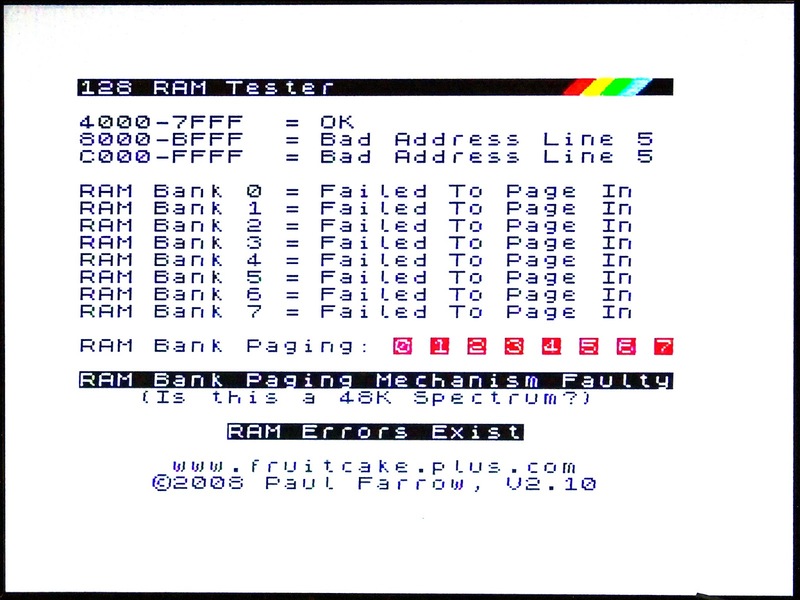 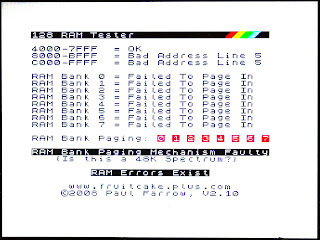 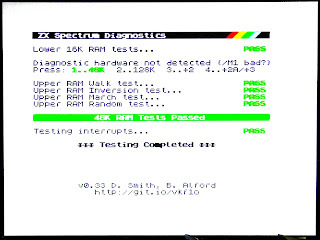 Firstly with the test ROM I used last time. 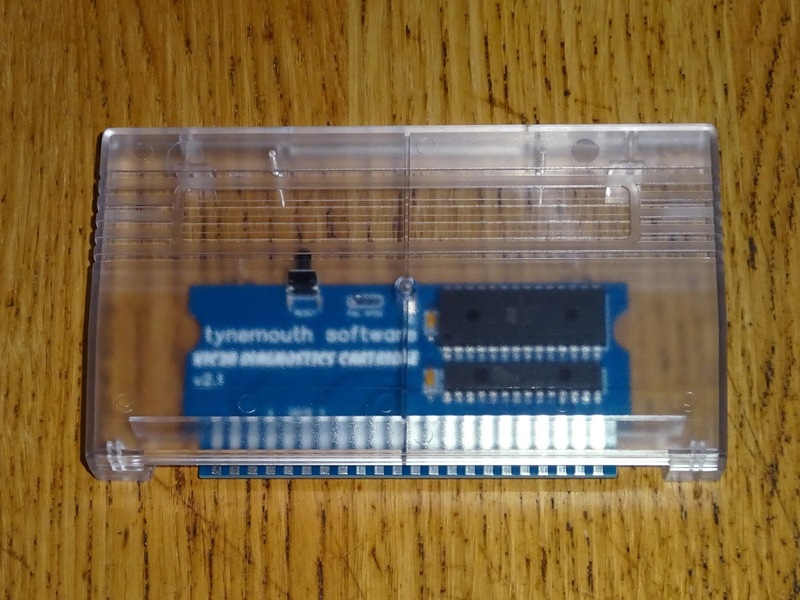 That's looking very nice, now to try some games out. 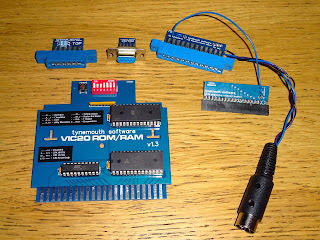 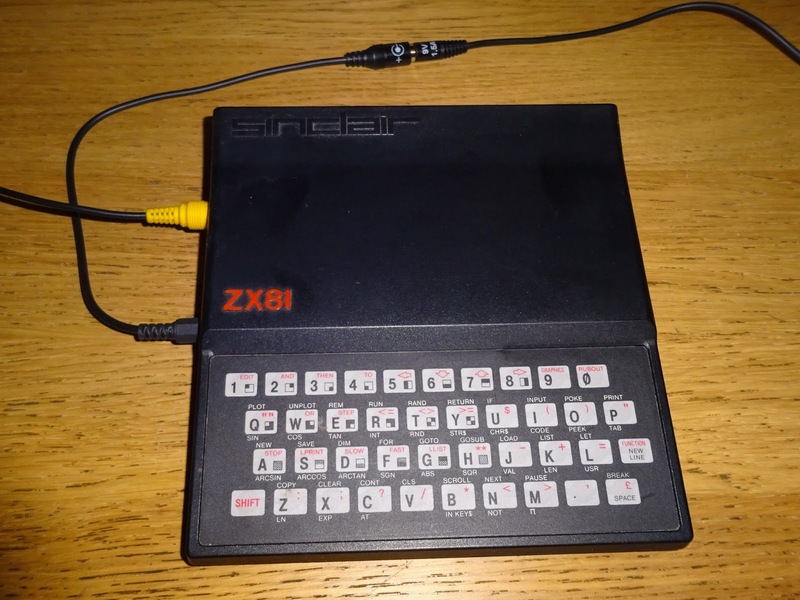 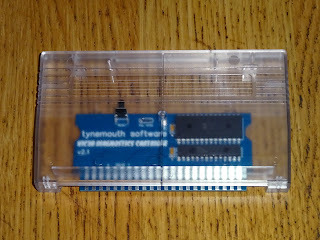 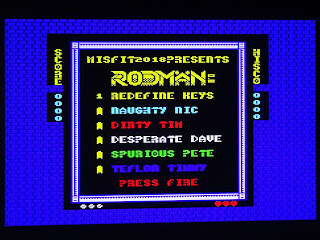 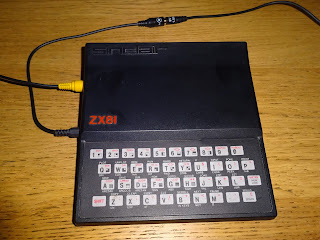 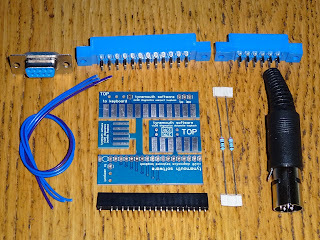 The Oric uses the same 7 pin DIN cassette connector as the BBC and the Acorn Electron, so I wired that up to an Acorn cassette deck. 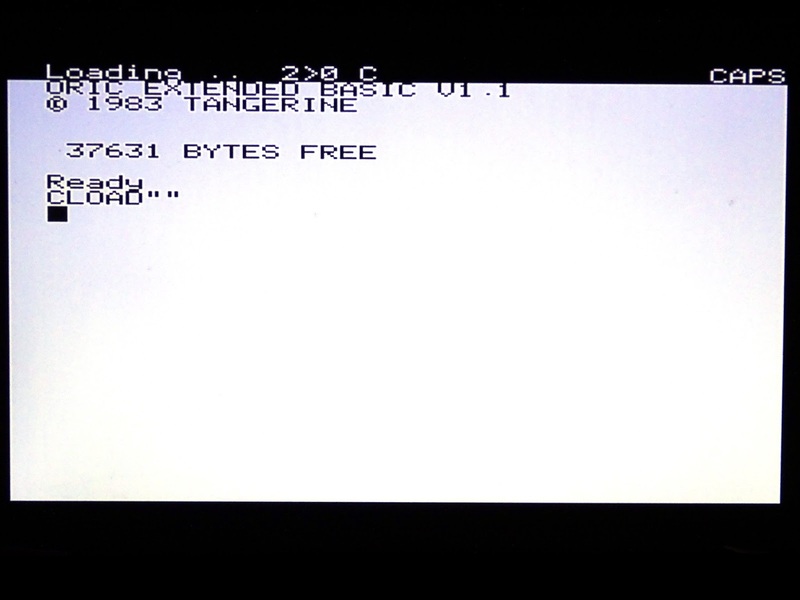 Surprisingly for an Oric, it loaded first time. 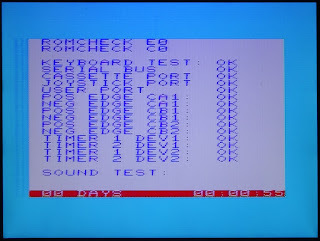 Time to do some testing on Rodmän.